On Monday, Apple (s aapl) made iTunes Match available to any U.S. iTunes account holder for $24.99 per year. For that fee, you get your entire music library stored in the cloud and made available to your Mac computers and iOS devices. On the surface, it’s an appealing process, but going from subscribing to Match to getting a usable library isn’t exactly a piece of cake. Apple has been having difficulty dealing with demand for the service in its first day of operation, and it seems to be implementing rolling brownouts of registration to cope with the issue. Many users complained that, like me when I initially went to confirm that the service was live, they are seeing a message advising them to try again at a later time. Subsequent attempts to get to the registration process worked, but Apple is still pacing sign-ups, presumably to prevent server overload. In the end, it’s probably for the best, since once users are in, they’re often faced with huge delays as iTunes scans their library, matches tracks and then uploads tracks that couldn’t be matched. The process is taking hours for some, and it threatens to be a process spanning multiple days for others. Many are complaining about the need to stop and restart the process on a regular basis to get past stalls, which is an issue we heard about from people during the developer beta. Were Apple to open the floodgates to everyone at once, this process would likely be more painful. Apple’s scan-and-match tech isn’t perfect, and it often requires that your library be in fairly good shape in terms of track, artist and album information. It runs into issues with low-quality tracks (it won’t match ones that are under 96 Kbps, for example, but Apple states this clearly on its website), and users are finding the difference between “purchased” and “matched” tracks a bit confusing (hint: one has to do with what you buy in the iTunes store, and the other is strictly limited to what’s included in the local library on the Macs you use for your iTunes Match scan and upload process). Despite its problems, once iTunes Match is set up, it seems to work as advertised, providing tracks for download from Apple’s servers. But it takes a long time and a lot of hiccups to get to that point, and users don’t seem to be all that clear on what (or what not) to expect from the service to begin with. Paying for delayed gratification is not something Apple users and iTunes music shoppers are used to. So based on the above and your own experiences, what do you think of iTunes Match? Did it need more time in the oven, despite already arriving late? Or is it just a different kind of service that inevitably requires a lengthy initial setup process in order to accomplish the magic it advertises? Yes, I say a lot more time in the oven. This has created so much work for me, I can’t believe it. “It just works” sure it does. Apple should pay me to use this service. No matches to 80% of Van Morrison stuff, come on. You’re kidding, right. I’ve experienced a number of problems with the service, a couple which are similar to problems seen with IOS 5. First, like others, I have several tracks that were uploaded that should have been matched (for example, two tracks of a CD were uploaded but the rest matched). Second, several tracks that used to play on iTunes are now greyed out, unaccessible and I can’t find out why. Third, when I tried to access my iTunes match account from my iPad, I received an error message that I do not have a subscription. Fourth, my Apple ID password was suddenly clobbered – at least I received a message that my password was not valid. I had the same experience with IOS 5. I hope some of these are just teething problems with the initial public release and caused by the heavy demand. I would have expected some of these issues to have been identified and resolved during the beta testing (particularly the match/upload issues). Upgrading 1800+ of my lower quality files to 256 kbps is worth the $25. ‘Hope everyone backed their collection up on DVD before starting this adventure. Monday 12pm, 71gb/8700+songs, 46 hours uploading to Tuesday 9:50pm, still have 1300 tracks to go. Multiple restarts. Combining this with all of my smart playlists to upgrade to 256k then deleting the 128kbs junk, finding real duplicates, not the originals with ease: are all priceless. I love my music collection even more now. Thanks Apple! too much work, I’m going back to cassette tapes. I’m looking for more info before attempting to sign up. I had some problems when I migrated from an old laptop to my current machine. Some audiobooks imported twice. I tried to edit so that the items were only in one location, but it created duplicate entries in the database. I didn’t want to lose my rating and play count info, too late to start over. This makes it look like I have 32,000 items, but I think it would be more like about 21,000 without the duplicates (which point to the same files). Afraid to delete the duplicates, as it deletes the original files rather than the iTunes database entries. Anywho, would be VERY happy if iTunes could clean up and remove the duplicate info. I don’t use a lot of playlists, use mostly genius mixes, so if all those go away that is fine with me. I use some podcast smart playlists, which are still managed with iTunes. Anyone seen what happens in iTunes if you had duplicates? Does it cleanup the song counts and remove the extras? The 2 things that iTunes Match is missing that would make it perfect to me: streaming on iOS devices (not downloads) and a website where you can access and play your library (not iTunes). I started the process at 7pm on Monday night and at 7am Tuesday morning, it was still processing but was about 98% complete. My iTunes library is only about 2,500 songs but in looking through the ones completed, iTunes Match only found a bare handful that it couldn’t or wouldn’t copy that weren’t in Apple’s database. I recognized a lot as tracks I’d copied from non-standard CDs from personal collections from DJ’s I knew when I lived in San Francisco so I’m not surprised. I purchased 25GB of storage in iCloud for $40.00 but now I’ve read that in order to stored iTunes music I’ll be charged $24.99. All my music has been purchased from iTunes. What can Apple do for me (besides nickle & dimming me) for storage space. It appears that Apple is restricting the storage space I have already purchased. I don’t recall being informed that I would not be able to use my 25 GB for music. Besides being sorry, which I don’t give a dam about, how can Apple make this right with me? It’s your own fault. Do your due diligence before your purchase. You are welcome to use your 25GB in iCloud for storing/backup of your music, you just won’t get iTunes Match functionality. They are 2 different services and are sold as such. 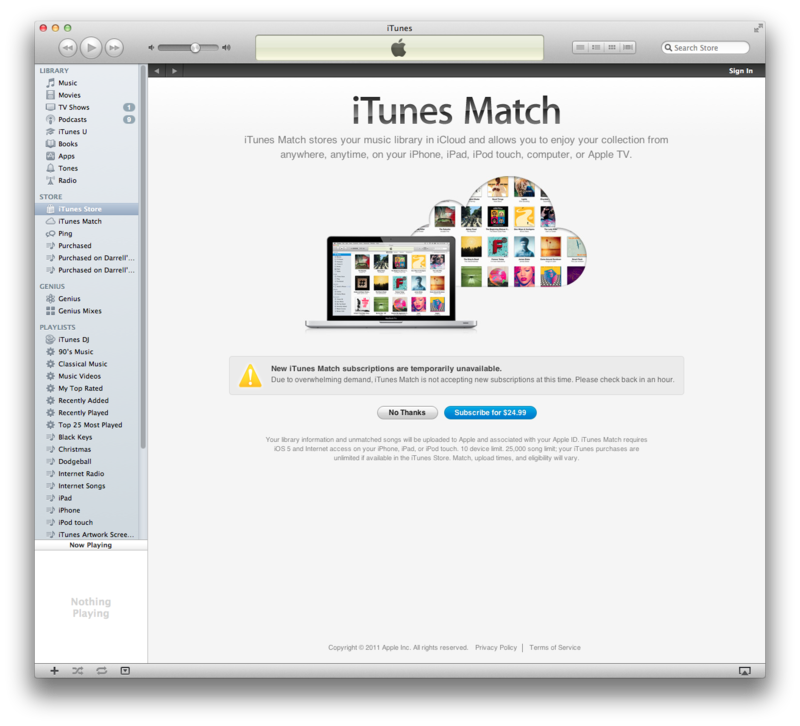 Anyone who has iTunes can purchase iTunes match, an iCloud account is not required. Apple has an enormous number of iTunes users. A galactic-size number of iTunes users. Even if 40% of them jump into iTunes Match on Day Zero (i did! ), that’s humongous number of users hitting a new service. Google doesn’t even have that many users of a music service, nor does Amazon. Even if they did, they don’t have any sort of feature that is processing this nearly-incalculable amount of data for this number of users. Give Apple some slack here, folks. iTunes was rolled out and upgraded over 10 years. I’m surprised it’s working as well as it is so far! Good work, Apple guys! I am so far less than impressed. I have 10,000 songs (granted, about 25% of those are hour long continuous dj mixes) that have been syncing/matching/uploading for 26 hours now. I’m really not a fan of the iOS implementation. Specifically the fact that you can have either USB syncing or iTunes Match. Not both. So, unless I’m missing something big here, I have to re-download everything I want on my iPhone on a per-track/per-album basis. What a waste of time. In all fairness though, $25 to get a majority of my library updated from 128kbps to 256kbps makes it pretty well worth it. It very well be worth the leg work considering the previous cost of upgrading to “iTunes Plus”. Whatever songs you had synced on your iPhone prior to turning on iTunes Match on your iPhone remains on your iPhone. You do not have to re-download them. Thanks for the “Start/Stop” tip it seems to be doing something once more… 15 hours and counting so far…. It is amazing!!! I love it!! The service works well if you are sharing between computers. iOS devices are a different story. My biggest complaint is that the play count and last played date are not updated when playing a song from the cloud on an iOS device. Also, devices cannot apply a lot of the criteria used in smart playlists, which make them rather useless. Of about 4000 songs, it only matched about 940. Many of the unmatched songs are good quality and mainstream music and defiantly available on iTunes. I don’t understand why it could not match them. I’m Going 15+ hours of uploading. What do you expect when dealing with large amounts of data? Of course it is going to take time to upload unmatched songs. That is an issue with your provider not Apple. I had 8600 songs in my iTunes library all copied from CD’s I bought. It matched about 7300 in 2.5 hours, not bad IMO. The remaining 1300 are still uploading but I would expect that. Expecting instant results when dealing with large music libraries is unrealistic. Again it is not an Apple problem, it is the nature of the technology. Once you get your library inMatch it works great so far. Seems like you are grasping to find something wrong with Match and/or your expectations are unrealistic. Agreed, the weakest link here is technology. We all know that Apple pushes technology to its limits and, surely, once we get past this high-time of matchers and uploaders, match will be working as expected. I’m hoping that at some point Apple will up the current 25,000 song limit. I would like to avail myself of the service but I have over 50,000 in my library. I am having a fairly long delay when playing music from iPhone. Once I hit play, there is a good 5 second delay before the song plays from iCloud. Maybe this is because of my phone, or maybe this is part of the large amount of people signing up to a new program. Either way, it is certainly a downfall. I am having the same results, including a crippling effect when scrubbing to different parts of a track. For example, in iTunes now when I play a matched song it initiates with a delay, and then I have to wait for the streaming to load before I can scrub to a later part of the song. The initial delay is very uninviting, as it is nice to be able to skip through songs quickly when unsure of what you want to hear (much like channel surfing w/ TV… except now it’s like channel surfing with Time Warner Cable where it takes forever). I assume the option to download specific tracks to specific devices will eliminate this for the tracks I listen to most often on any given device.. say iMac (where I currently store my main library), my MBP and my iPhone. It should be nice to have a centralized location for everything and be able to call upon any song in my library unlike now where I have to do a sync to get songs onto my phone, etc. I just signed up about 30 minutes ago though, so this is only an initial reaction. I hope, somehow, the delay is minimized with time.